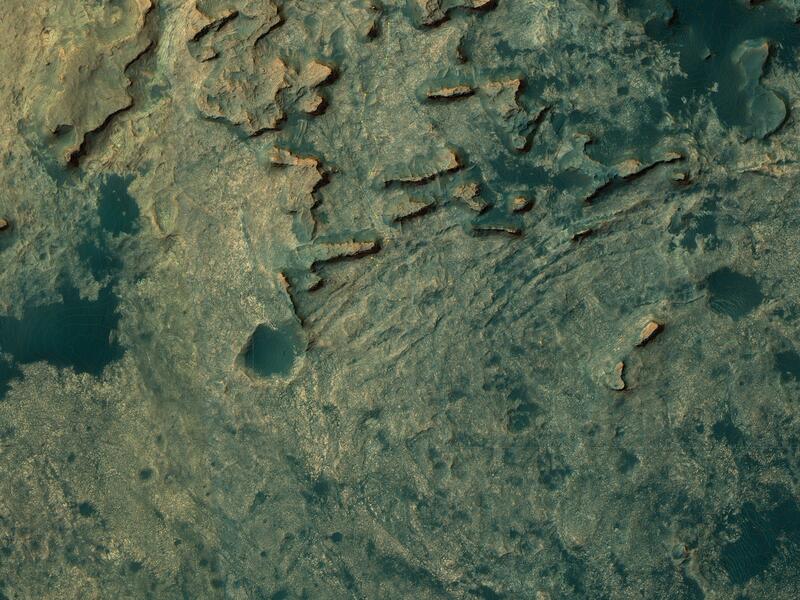 For the overall context of Curiosity’s travels, see this post, Pinpointing Curiosity’s location in Gale Crater. In the past week Curiosity finally left Murray Buttes and began moving south towards Mount Sharp, and, for at least one day, I thought tracking the rover’s movements might become easier. 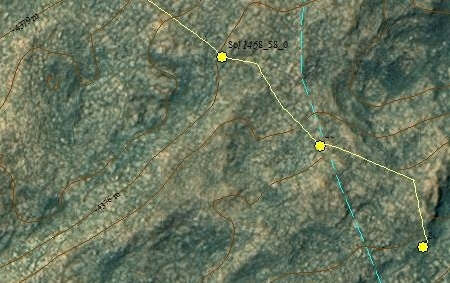 Early in the week the science team published an updated overhead traverse map that not only showed the topographical elevation contour lines for the surrounding terrain, but also included a blue line roughly indicating the rover’s future route. For reasons I do not understand, however, they only did this for one day, and then went back to the un-annotated traverse maps they had been using previously. I have therefore revised the most recent traverse map, shown on the right, to include these contour lines as well as the planned future route. 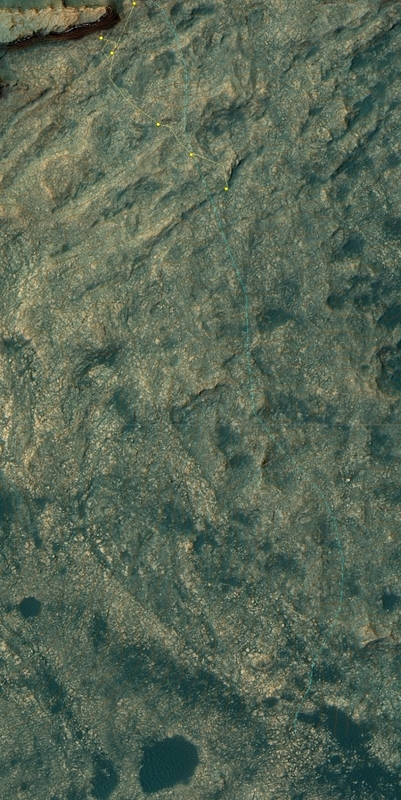 The contour lines are hard to read on the full image, but below the fold on the right is a zoomed in view of Curiosity’s position as it left Murray Buttes, which shows the rover’s elevation at about 4376 meters below the peak of Mount Sharp. This means the rover has gained about 1,150 meters, or about 3,775 feet, since its landing, but only 50 meters or about 150 feet since March of this year. It is still not on the mountain but in the low foothills at its base. 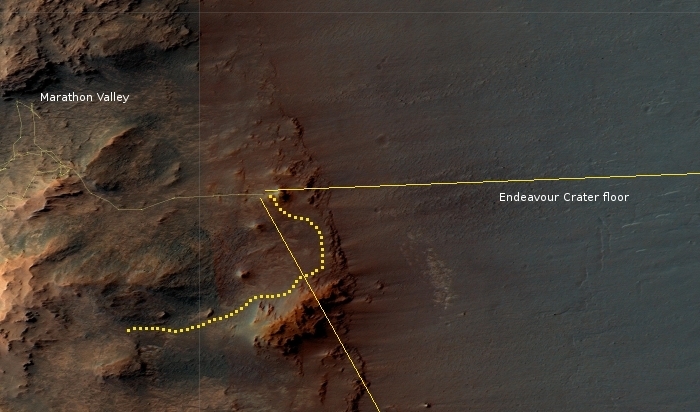 For the overall context of Opportunity’s travels at Endeavour Crater, see this post, Opportunity’s future travels on Mars. Since last week the Opportunity science team sent the rover due east, right to the edge of the mound that had been in the center of the Sol 4498 panorama I had created in my Sept 20th update. As it turns out, this mound was the northernmost mound in the overhead traverse image, not the middle mound as I had guessed incorrectly. Below is a cropped version of the most up-to-date overhead traverse map, annotated by me for context. I do not know where they will send the rover next, but my best guess, indicated by the dotted yellow line, would be that they will head south and east to get as close as they can to the inside edge of the crater rim. From there they could then head south to that large outcrop, then back west into the gap to look at the dark patches of ground there. 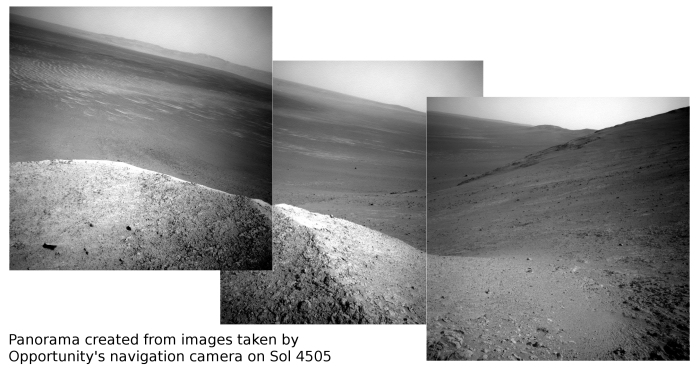 This guess is partly based on the panorama below, created from images taken on Sol 4505 by the rover’s navigation camera. The rover now sits quite close to the mound so that it can almost look down past it into the crater’s vast floor. 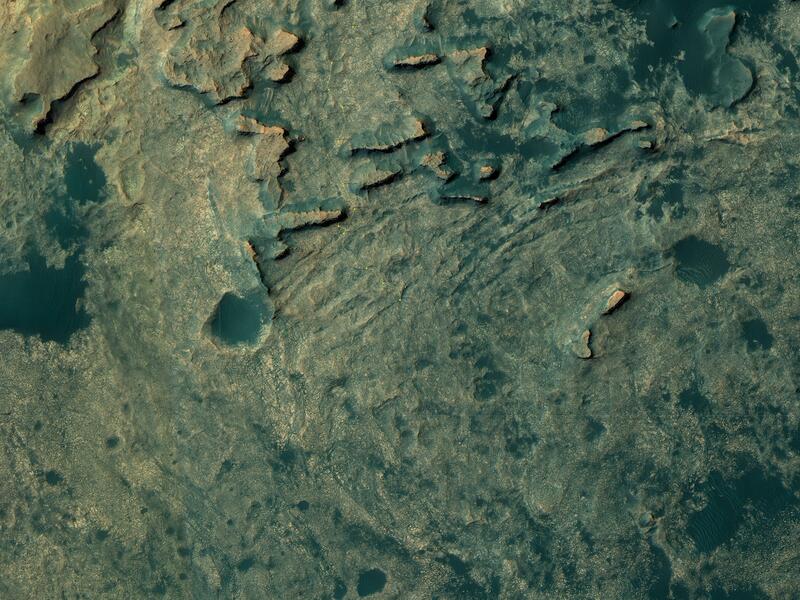 I have indicated what I think this panorama shows on the traverse map above, which also shows that my theorized route travels directly down the center of this panorama.